The Alliance said they were going to waltz through Serenity Valley, but the browncoats made them choke on those words. Here's your exclusive first look at a brand new statue showing Firefly's Mal Reynolds in his darkest hour. Plus a new Firefly/X-Files poster, and a "cutaway" version of Serenity. 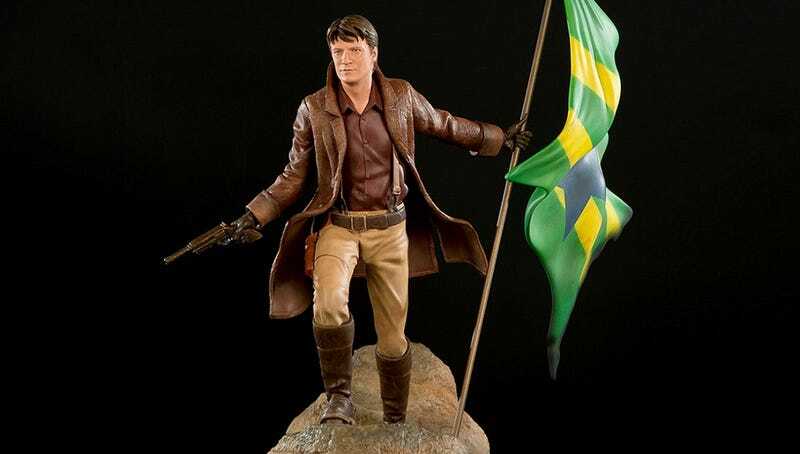 We're thrilled to be able to bring you the exclusive reveal of this 1:6 scale statue of Mal Reynolds at the Battle of Serenity, from Quantum Mechanix, the makers of all your favorite Firefly paraphernalia and the producers of Firefly Online. As QMX explains, "Every detail has been reproduced with exacting fidelity, from his trademark Moses Brothers sidearm to the brass buckles on his brown suede duster." Check out more high-res pictures below. Taking the X-Files' famous tagline and adding a Firefly spin to it. Serenity is out there. You can pre-order the poster here, and below is a high-res version. You can lift the upper hull sections of this 1:250 scale model, revealing the cockpit, main corridor and gallery furnished with chairs, lockers, consoles and carpets. The sets are painstakingly reproduced in this 12" scale model. And finally, a new pendant commemorating Wash's final words. With a tiny Serenity on it.